Despite significant similarities between the United States and Canada, including their geographical proximity, the two country have very different laws regarding guns ownership and guns control. In Canada, gun deaths are very rare and the process to obtain and possess a gun is rather long and complex, and it involves a meticulous background check on the person interested in purchasing the firearm. Gun laws and gun control are two hot topic in the United States. In the US, buying and owning a gun or a firearm is quite simple and the license is not always required. For this reason, the US has one of the highest rates of gun violence and gun deaths in the world. In recent months, young people, regular citizens and activists have marched and protested against the existing gun laws, asking for stricter rules. Even though there has always been a strong movement against firearms in the US – and in the world in general –, the recent mass shootings occurred in high schools and concerts in the United States have raised awareness and prompted citizens to demand stricter regulations. Yet, the strong presence and influence of the National Rifle Association (NRA) – one of the strongest and most powerful lobbies in the country – has posed serious obstacles to those challenging the current system. The main differences between the US and Canada concerning gun laws and firearms ownership are linked to cultural and historical factors. In the US, many people believe that gun ownership is a fundamental right, strictly tied to the right of self-protection, whereas in Canada, owning a gun is not considered a right. Background checks are run against an FBI database by gun sellers at the moment of the purchase, but gun-control activists have argued that those checks are not sufficiently meticulous. In the US, there is also a difference between open and concealed carry. In general, there are stricter rules concerning open carry of guns in public places. 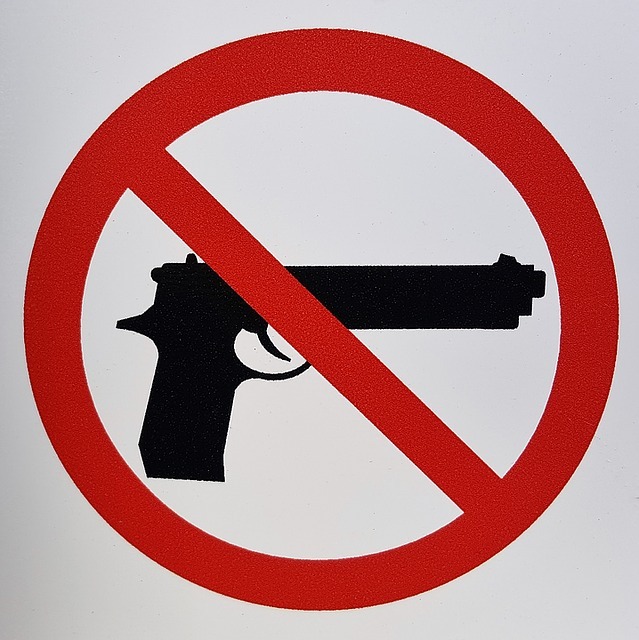 For instance, some states prohibit openly carrying firearms in public, whereas in other state such as Florida, Illinois and California, it is prohibited to openly carrying long guns, but not handguns. Thirty-one states allow people to openly carrying a handgun without permits or licenses – although the arm must be unloaded in some cases – whereas fifteen states require a form of permit or license to be able to openly carry a handgun. When open carry is not allowed, citizens can sometimes carry a handgun in a concealed manner. Concealed carry is allowed in most states, although with different degrees of freedom. What is Gun Law in Canada? Historically, Canada has always had strict laws in place regulating the ability of citizens to carry firearms and guns. Since the beginning of the Canadian Confederation in 1867, those carrying a gun without permit or reasonable justification could be legally penalized and prosecuted. Further restrictions were later introduced in the Canadian Criminal Code, while in 1937 the law first required that guns ownership was registered, including detailed records of the owner as well as of the handgun purchased. In 1977, with the Firearms Acquisition Certificates (FACs), registration of purchase was extended to firearms of any type and those willing to purchase a handgun as well as ammunition had to first pass criminal record checks. In 1991, a new bill required that FAC applicants had to pass a safety test in addition to the background checks, and the waiting period for the release of the FAC was extended to a minimum of 28 days. The licensing system was centralized in 1995 and two types of license are available today in Canada: possess-only and possess-and-acquire. In addition, in some cases, Canadians need a third-party reference to vouch for them when buying a handgun. In Canada, the license is denied to anyone with a criminal record, with mental health problems or with a history of domestic violence. Moreover, unlike in the US, automatic weapons are completely prohibited as well as rifles, shotguns and modified handguns. 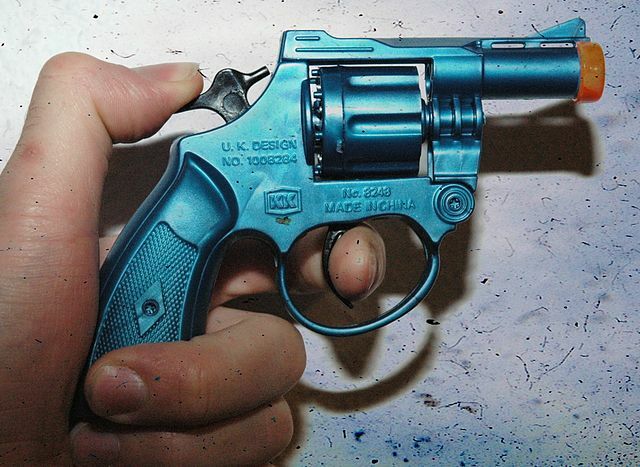 Due to the strict rules that apply to gun purchases and regulations, owning a handgun is not very common in Canada, and the country has one of the lowest rates of gun-death in the world. What is the Difference between Gun Laws in Canada and the US? One of the main reasons why gun laws in the US are particularly hard to change is the strong presence of powerful lobbies, especially the National Rifle Association. The NRA invests every years million of dollars into politics and supports with large donations selected candidates during the election period. As such, the NRA controls key players in the American governments, especially within the Republican party. In Canada, gun lobbies are much weaker and have less influence on the government. The United States and Canada have many aspects in common, including historical and geographical similarities, and their cultures are similar in many ways. Yet, the two countries’ approach to gun laws and gun ownership is very different. 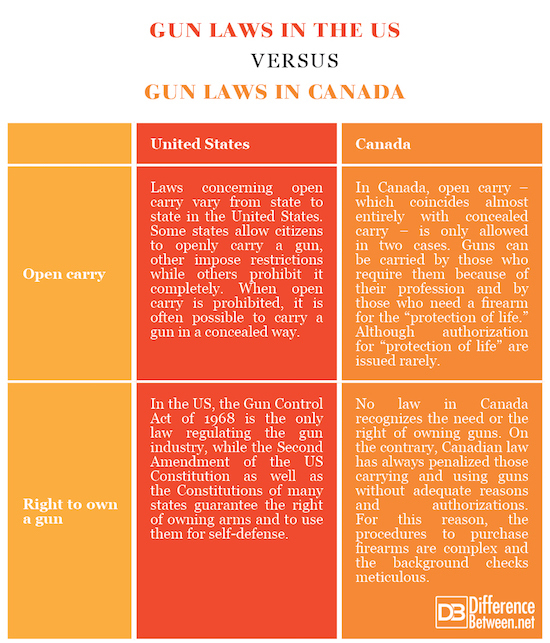 Building on the differences highlighted in the previous section, we can identify other aspects that differentiate gun laws in Canada and the United States. The debate around gun laws is a hot topic in the United States, where mass shootings have cost the life of dozens of people in the country. Gun control activists and regular citizens argue that gun laws in the United States are not effective and that background checks are not sufficient to determine whether individuals are fit to own a gun. In the US, buying a gun is very easy and quick. All a person needs to do is enter a gun store licensed by the Federal government, provide ID proof, file a Form 4473 (the Firearm Transaction Record Over-the-Counter application), and leave the store with the gun. Indeed, rules vary slightly from state to state, but, in general, buying and carrying a gun is rather simple. Conversely, Canadian law is much stricter and does not recognize the right of owning and carrying a gun, unlike the US Constitution. In Canada, background checks are more meticulous and there are restrictions regarding open and concealed carry. Due to the significant differences between gun laws in Canada and the US, it is not surprising that gun-death in Canada is among the lowest in the world, whereas shootings and gun-killings in the US are rather common. Giulia Squadrin. "Difference Between Gun Laws in Canada and the US." DifferenceBetween.net. June 4, 2018 < http://www.differencebetween.net/miscellaneous/politics/difference-between-gun-laws-in-canada-and-the-us/ >. McGinty, Emma E., et al. "Public opinion on proposals to strengthen US gun laws." REDUCING GUN VIOLENCE (2013): 239. Mundt, Robert J. "Gun control and rates of firearms violence in Canada and the United States." Canadian J. Criminology 32 (1990): 137. Ouimet, Marc. "Crime in Canada and in the United States: A comparative analysis." Canadian Review of Sociology/Revue canadienne de sociologie 36.3 (1999): 389-408.